Written for mental health professionals and non-professionals who are interested in bringing the power of God into their work by integrating Bethel Sozo into their therapeutic model. This book is written for mental health professionals who are interested in bringing the power of God into their work by integrating Bethel Sozo, a unique inner healing and deliverance ministry, into their therapeutic model. It will also benefit non-professionals who are interested in learning about personal growth and healing and how it relates to psychology. 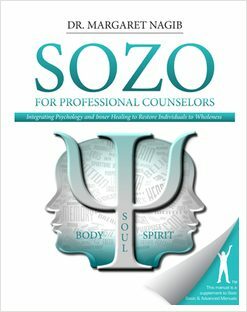 Based on Dr. Margaret Nagib’s personal experience using Sozo in the clinical setting, this easy-to-read manual provides practical instruction and real-life examples of how Sozo and psychotherapy can be used in conjunction to achieve effective, efficient, and powerful transformation in the lives of clients. Dr. Margaret Nagib is a clinical psychologist specializing in Christian counseling, inner healing, and in the treatment of eating disorders, trauma, self-injury and mood disorders. She received her doctorate in clinical psychology from Wheaton College in Wheaton, IL and has been working in the field of Christian and secular psychology since 1998. She graduated from two years of Bethel Church’s Supernatural School of Ministry (BSSM) in 2011.